Even dogs need a pillow! Kevin snapped this awesome shot of Lola today through our kitchen window. 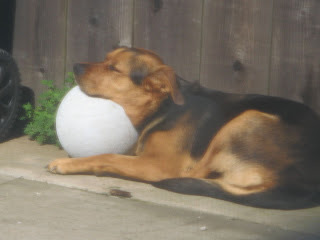 He peeked out and lo-and-behold Lola fell asleep on her basketball! What a crackup. That girl never ceases to make us laugh! I had President’s Day off so Kevin and I decided to get out of the city, take advantage of the sunshine and take a day trip to the Marin Headlands. After checking out some of the views over the cliffs, we got hungry and had a nice little picnic in the car. Then we headed over to Battery Wallace (a battery is a place in which a group of guns/missile launchers are operated together in one place, there were quite a few out that way). The fog kept rolling in and out, and at this point it was pretty foggy so I thought it’d be cool to take a photo like this (if you click it you can enlarge the photo to see it more clearly). I was trying to get all artistic and have Kevin take this photo of me in a small corner filled with graffiti. There were a ton of huge metal doors that had been sealed shut but I thought this one looked pretty cool. After checking out the old abandoned military bases, we went to make a visit to the Marine Mammal Center which is free and open to the public every day of the year except for a few major holidays. We got lucky because President’s Day wasn’t seen as major enough for them to be closed! The time we went to visit most of the sea lions were enjoying their naps in the sun. “Big Daddy” wanted to say hello to our blog followers! I couldn’t resist! What a cute little pup. Beatles Brunch and Alison/Seth’s visit! Jessie had a fantastic get together at her apartment last Saturday (2/13) called the Beatles Brunch! She’s got quite a talent for cooking, especially breakfast foods, so she had a bunch of friends over for brunch that she made all on her own! Two amazing scramble dishes (one with bell peppers, spinach and goat cheese…oh my! ), bacon and home style potatoes. Breakfast “dessert”…sour cream coffee cake (Kevin’s specialty that he brought along) and Jessie’s chocolate croissant banana bread pudding…yum!! She had the super cute idea of leaving out arts & crafts supplies and people making their own valentines…awwww! That night we had a rare night out on the town because my friend Alison and her husband Seth were in town from Irvine! Alison is originally from Walnut Creek (in Contra Costa County) and she and I met at Redlands. Seth is in a PhD program at UC Irvine so they’re living in Orange County for now but are planning on coming back up to the Bay Area when he’s done (3-4 more years). She and some of her friends from home came out to the city for the evening. In the early part of the evening, Alison, Laura, Kevin and I went to dinner at Papalote’s Mexican Grill in the Mission (they have the most unbelievable creamy salsa you’ve ever had!) We then met up with Seth, Daniel and Eric in the Castro and spent a few hours at The Cafe, a really fun gay nightclub. Kevin had to fight off the boys at the club, haha! The past few months we’ve ventured out and tried some new restaurants that I’d like to share for those of you planning trips to the city! The Hidden Vine: An amazing little wine bar near Union Square. Me, Kev and Jessie went here and had a fantastic time. The atmosphere is extremely cozy with big, plush armchairs grouped together for small groups to get together and relax over a bottle (or two) of wine. Decent prices. It’s kind of tricky to find so don’t be afraid to ask around! Barney’s Gourmet Hamburgers: A really great hamburger place in Noe Valley. We went here with our friend Maya who lives in the neighborhood and highly recommended we eat there…we were definitely not disappointed! They’ve got a great variety of beef, turkey and veggie burgers and amazing sweet potato fries. We will definitely be back! Roosevelt Tamale Parlor: A cute little hole-in-the-wall Mexican restaurant in the Mission (what restaurant isn’t a hole-in-the-wall in the Mission?) Me and Jessie went here last week for a mid-week sister’s dinner. They’ve got a great selection of tamales but they were a little dry which was unfortunate. The salsa is super spicy so just be ready for that. Fast, attentive service and a warm atmosphere. Day 2, Tues.: $500 worth of tests/x-rays at SPCA, sent home with meds, the problem continued. Called them back, they suggested hospitalizing her for 1 1/2 days (estimated $1,000). Day 3, Wed.: A co-worker recommended his vet, they also suggested hospitalizing at ER hospital down the street (est. $500). Other option to give fluids intravenously and send her home (which we did). Problem got worse, she woke up with–and I apologize in advance for the graphic details–diarrhea that looked like pure blood. Again they wanted to send her to ER hospital (est. $500) but after seeing the struggle that Kevin and I were going through to see the bill grow by leaps and bounds each day, he gave us an amazing option: though normally they don’t hospitalize pets at their facility because no staff on duty, for $100 Lola could stay at their facility and the doctor said that he would stay at his parent’s house in the city so that he could check in on her during the night…amazing. Took blood sample. Day 4, Thurs. : Still no improvements, we were afraid we might have to put her down. Blood test results came in: white blood cell count and albumin (a blood protein) levels were dangerously low. Doctor said that if levels didn’t get better, she’d need a plasma transfusion. We never got an estimate but we knew that we could never afford a procedure such as that. Lola was extremely lethargic (barely lifted her head) and still not eating/drinking. Kept her hooked up to fluids/antibiotics another night. Day 5, Fri.: Doctor retook blood test mid-day (hopeful that after 1 1/2 days of being hooked up we’d see improvements). During our visit she seemed to have improved by leaps and bounds! She actually stood up to greet us and went for a walk outside. Blood test results: white blood cell count almost back to normal, albumin level still extremely low which meant is was still life-threatening. The doctor wanted to keep her through Monday to make sure that Lola’s body was given a chance to recover. She knew that the cost of hospitalizing her for 3 more days/nights would be impossible for us so she offered to keep Lola at the facility, hooked up to fluids/antibiotics until Monday evening without charging us a penny. And on top of that, their office is closed on Sundays but she was going to come into the office to administer Lola’s meds and check in on her. She did this for us even though Lola hadn’t even been a patient of hers for a week. It was in that moment that I was reminded that there are some truly amazing people in the world, and our vet is one of them. My heart was overflowing with appreciation. Days 6 & 7, Sat. 7 Sun. : Slow improvements in energy level and desire to eat/drink. Day 8, Mon. : She was finally able to keep food, water and meds down so she came home that evening! Week 1 of recovery: When she came home she was skin & bones (she lost 6 pounds, and for a 48 pound dog that’s quite a drop in one week) and still had very little energy. But each day Lola regained more and more strength and at our one week checkup with the doctor she was so impressed with her recovery! Today, six weeks since she first showed signs of illness, Lola is doing FANTASTIC! Other than her “battle wounds” (the shaved areas of her front legs where they had to put the IV’s in) that are still showing, you honestly could not imagine that just 6 weeks ago she was hospitalized and on the verge of death. We have absolutely grown a new appreciation for our little girl Lola and there isn’t a day that goes by that I don’t think about how lucky we are. She is absolutely the best thing that has happened to us in our move to SF and we hope to have her as a part of our family for years and years to come! This is one of my favorite pictures of Lola, I had it up in our house while she was hospitalized to help keep me thinking positive and remind me of how she looked when she was healthy and full of energy!